Hey guys! am back with a movie review, and this is one I was really interested in watching cos it stars Liam Neeson, one of my favourite actors. Thanks to TGV Cinemas, I got to catch the premiere screening of this. Read on to hear my thoughts! Synopsis: Nels Coxman's quiet life as a snowplow driver comes crashing down when his beloved son dies under mysterious circumstances. His search for the truth soon becomes a quest for revenge against a psychotic drug lord named Viking and his sleazy henchmen. Transformed from upstanding citizen to coldblooded vigilante, Coxman unwittingly sets off a chain of events that includes a kidnapping, a series of deadly misunderstandings and a turf war between Viking and a rival boss. Full disclosure here, I went into the movie not knowing anything about the movie, except that Liam Neeson is a father seeking revenge for his only son. Therefore, the first part of the movie is just you expecting the son to die, and seeing what becomes of Liam, who ironically, became a killer killing off those who murdered his son, despite being awarded Citizen of the Year in the beginning of the movie. It took me a while to understand the nuances of the movie, and about an hour into it, I realised that this movie is kinda like a dark humour comedic movie, where parts of it are funny, but not overly so. 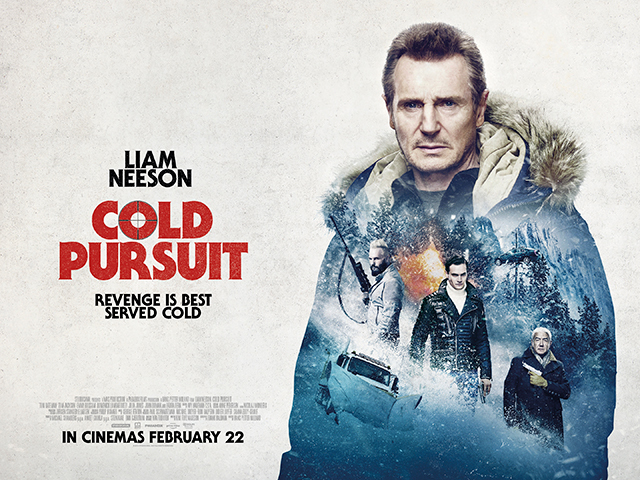 When his son is murdered, Nels Coxman (Liam Neeson) sets out to find the men behind this one person at a time. Overall, I quite liked this movie. Of course, I didn't understand it in the beginning but once I did, I felt that there were little touches in the movie that made it that much more interesting. Although there was a bit of character development for the main cast, I felt that Laura Dern's role was too short, and much more could have been done to explore her casting a little more. One of those little touches that I spoke about is the title card which shows the name of the deceased with an illustration that denotes their faith. When this title card comes out, you know the person's dead. And there are A LOT of times that the title card appears. What can I say? the movie is a total bloodbath. Another touch I liked was towards the end of the movie, where Liam meets the druglord's kid, and the two of them hit it off. So much so that the two begin to look after each other, and you can see the affection Liam has for the little boy. Mostly because Liam is not actually a bad person to begin with, as all this killing was necessitated because he wanted to avenge his son's death. All in all, I would say it's a pretty entertaining movie, and I do not mind watching it again if it comes out on HBO or something. If you haven't seen it, go in without expectations, and I think you'll have a pretty good time. The movie is out, and currently showing in cinemas nationwide. Would you watch it? Let me know!